The Pittsburgh Penguins scored 5, count them 5, 3rd period goals and blew out the Rangers by a final score of 6-2. The game itself started out very well for the Rangers. Nikolai Zherdev rifled a wristshot past Marc Andre Fleury to give the Rangers an early 1-0 lead. Unfortunately, Petr Sykora evened it up by swatting a puck by Lundqvist as he was being bumped by a Penguins player. I thought the Rangers had the better scoring chances in the 1st period as well as the 2nd period. The Rangers outshot the Penguins 26-17 over 2 periods. I started to get that uneasy feeling that's been with me all year... dominate, but can't score and the 3rd period was the unraveling of the Rangers. Jordan Staal's innocent backhand from behind the net went off of Lundqvist's stick, then his skate, for a 2-1 Penguin lead (Lundqvist had some trouble with the easy ones tonight, maybe a little rusty?). Then, it all went down hill fast as Kris Letang (a beautiful shot) and Petr Sykora (Ranger killer lately?) gave Pittsburgh all they needed to put it on cruise control. Marc Staal cut the lead to 2, but Letang wheeled his way through the Ranger team for his 2nd of the game and of course, Sidney Crosby would finish the Rangers off with a nice backhand to make the final score 6-2. My thoughts on the game are that the Rangers obviously played well for 2 periods and had many opportunities to take at least a 2 goal lead into the 3rd period. But, this is the Rangers... a team that, to put it nicely - struggles to score. Period, end of story. I've come to realize, begrudgingly, that in order for the Rangers to win they must play the low scoring 3-2, 2-1, type of game. It's that simple. Low scoring games might not be what the Ranger faithful want, but unless there is a major trade this is the way that it will have to happen. Just my opinion. Kind of like the win against Carolina, that's been the Rangers in a nutshell this season. It's not all gloom and doom though... 5-2-1 in the last 7, but it's going to be a tough one in Beantown on Saturday. Over and out. Update: I will be attending Adam Graves night tomorrow at the Garden. Be back with a report! Not Pretty, But Rangers Get the Job Done! In a game that I felt was huge, considering the Devils had jumped ahead of the Rangers in the standings with the Flyers only 1 point behind, the Rangers came through with a hard earned 4-2 win over the Anaheim Ducks. What can you say other than this team never makes it easy on themselves. After taking a 1-0 lead off of a Markus Naslund slapshot on the PP, the Rangers gave it right back less than a minute later. Bobby Ryan scored his 14th of the season on a PP off of a terrible tripping penalty by Aaron Voros behind the Ducks net. Let's see... the Ducks have the puck behind their own goal, right? They can't possibly score from there, so I think we'll take a tripping penalty? Sorry, Aaron. You weren't thinking and it cost the Rangers. In the 2nd period, Fast Freddy Sjostrom roofed a beauty over the left shoulder of Jonas Hiller to give the Rangers a 2-1 lead. Also, guess what? It was a shorthanded goal! It was nice to see the Rangers get one while shorthanded for a change, considering they have given up way too many on themselves. Things were going fairly well up until Dmitri Kalinin (who has played well lately) got caught staring at the puck as Corey Perry danced by him and slipped a shot past Lundqvist's left pad. Sorry, but you're taught early as a d-man to never look at the puck - you have got to look at the midsection/chest area or what happened to Kalinin is pretty much guaranteed. Going into the 3rd I wasn't sure how this one would end. Luckily for the Rangers Scott Gomez, yes THAT Scott Gomez, showed some great hand work and backhanded a beautiful pass from Markus Naslund past Jonas Hiller on the shortside. Trust me on this one: Gomez's backhand was a difficult one, but he pulled it off! Hats off to him. The goal, by the way, was another PP goal. Although at times the PP was horrible tonight (2 icings on the same PP), the final result was 2 of 7, and in the end that's what counts. Blair Betts, who played a great defensive game, finished the Ducks off with a big steal on a Ducks PP with an empty net goal (he deserved it). It wasn't a pretty game, but the Rangers are used to these kind of games and now get a break for the upcoming all-star game. Big win, back in first for the moment... so what's there to complain about? Lastly, you gotta love Dubinsky and Callahan showing some balls out there and throwing down with Drew Miller and Travis Moen. I, personally, enjoyed seeing that kind of spirit coming from 2 of the younger guys. Good job by both. Over and out! Update: I will be away this weekend doing some more Quinnipiac Bobcats games on the radio. I will answer any comments when I get back! Not exactly the way you would like to finish up a 5-game road trip, especially with a 3-0 shutout loss to the Pittsburgh Penguins on Sunday. 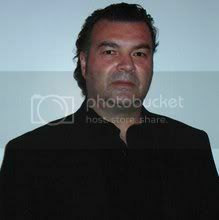 In the game, the Rangers had nothing, zip, nadda. When Chris Menard scored his 1st NHL goal at 7:35 of the 1st period, little did we know that his goal would be enough. Goals later by Tyler Kennedy and Petr Sykora would make it a final score of 3-0, in favor of the Pittsburgh Penguins. The Rangers offense was terrible from the start. No 2nd chances, no driving to the net, it was anemic at best. Pittsburgh looked quicker, sharper, and let's face it - they looked like the hungrier team. The Pens also exposed what I have known for quite sometime... the lack of a pure scorer and a physical presence (outside of Colton Orr). The Blueshirts have survived this long without it, but definitely will need to find a little of both for the stretch run and the playoffs. I also want to mention that anyone who uses the excuse of being tired at the end of a road trip is wrong. Dead wrong. It's not like the Rangers were on a west coast road trip with the time changes and miles upon miles to travel. Outside of Chicago, the Rangers stayed in the Eastern time zone the entire road trip. Sorry, but it's a bad excuse. Overall, it was a good trip for the Blueshirts getting 7 out of a possible 10 points. Back home against Anaheim on Tuesday at MSG. But, one more thing about the game... what was with the love fest for Pittsburgh on NBC? Was Sidney Crosby playing against anyone? Does he even have any teammates? Over and out! 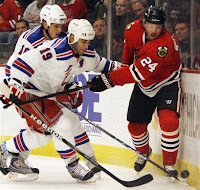 Rangers Beat Blackhawks... and NHL Too! If you're a New York Rangers fan, you have to be elated about tonight's win over the Chicago Blackhawks by a score of 3-2 in OT. When Chris Drury deflected a shot past Nikolai Khabibulin - not only did it give the Rangers the win, but it also stuck it to the NHL and its garbage rules. I'm sorry... but this game, in my estimation, was embarrassing for the NHL and the powers that be. I hope Gary Bettman watches a tape of this game to see what a travesty the post-lockout rule changes have caused. There's no more hiding the facts, the fans of this great game are not stupid. You can not tell me or the fans that this is what we want to watch night after night. This one really takes the cake! As for the Rangers - unbelievable! That's all I can say. I tip my hat to the Blueshirts for persevering through this "butchering of a game". As for the NHL, go look at yourselves in the mirror. You might not like what you see. I certainly don't! Over and out! 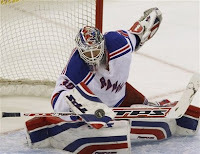 In what has become the Ranger way for most of the 08-09 season, the New York Rangers slipped by the New York Islanders by a score of 2-1. A goal by Chris Drury and a PP goal by Nigel Dawes erased a 1-0 lead by the Islanders and gave the Rangers the lead that they wouldn't relinquish. 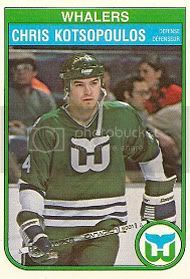 Drury's goal was assisted by Scott Gomez on a nice drop pass with Drury finishing it off with a great wrist shot past goalie Jann Danis (who replaced Joey McDonald early in the 1st period). Nigel Dawes' goal was off of an easy pass that was set up beautifully by Ryan Callahan on a 3 on 1 break on the PP. 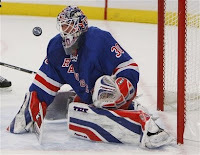 The Rangers held on from there as the King turned back a total of 33 of the 34 shots that he faced. On the flip side, the Rangers fired 29 of their own. My observations of this game are the Rangers never get away easy. It's almost like they enjoy these close games... or is it they realize they can't and never will be an offensive juggernaut? I think it's the latter. Physically, they were out of it, which is common - but I really didn't like the way Tim Jackman was running around without any repercussions. You can't allow that to happen and someone should have let him know. I will also continue to hammer this point... Ryan Callahan, pound for pound, dollar for dollar, has been the most consistent Ranger all season. In fact, if I had a vote - he would be my MVP of the skaters on this team. Obviously, the King would be the overall MVP... but Callahan would be a close second in that race as well. I really don't see any argument here. Again, so far so good! 5 points on 5 goals with only 2 against in 3 road games? Impressive. The Blueshirts got a little help with Philly, Washington, and Montreal all losing - so back in first for now. The real test comes Friday in Chicago where I don't believe 2 goals is gonna do it for the Rangers. They are going to have to score, because Chicago will! Over and out! After giving up 6 goals at home against the Montreal Canadiens, the New York Rangers tightened up the D and have gotten off to a great start on their road trip by taking 3 of a possible 4 points in their first 2 games. These points are ever so important as the Rangers have lost control of first place in the Atlantic division - but are still battling to stay at or near the top. Trust me, 3 points on the road is a good thing! With the King well rested, the Blueshirts played the Senators tough with timely scoring by Brandon Dubinsky and Lauri Korpikoski. Henrik Lundqvist turned aside 33 shots for his 2nd shoutout of the year and the Rangers walked out of Ottawa with the 2-0 victory. The team played well overall, but I got to give props for the play of the youngsters who night in and night out have been the better Rangers players. The 3 that stand out most to me as of late are Prucha, Callahan, and Staal. It was also nice to see Korpikoski and Dubi break the ice with goals (Boy, was Dubinsky in a slump). It was also interesting to see how Chris Neil of Ottawa tried and really did take advantage of a few Rangers players (Prucha & Staal). But, when facing probably one of the most honest tough-guys in Colton Orr, he declined. I'm not here to say Neil chickened out (he is a legitimate tough-guy himself)... but you make the call. 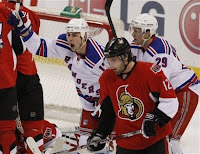 Also, I would like to comment about the Rangers streak of not taking a penalty in Buffalo and most of the Ottawa game. I guess Renney's comment struck a chord with the referees after the Montreal game. I personally am here to tell you that no matter what era or decade of hockey - It's impossible to play this game without penalties. How the Rangers got away with it is beyond lucky. Fortunate? Absolutely. 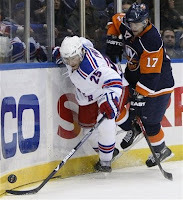 The Rangers will get a good rest and off to Long Island to face the hated Islanders. So far, so good! Lastly, I just wanted to say that it's a sad day for Rangers fans as Brendan Shanahan has decided to sign with his first NHL team and hated rivals, the New Jersey Devils. 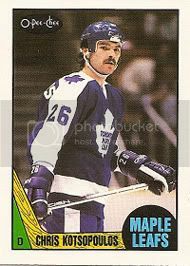 Shanahan was a good player for the Rangers and one of the key players in the post-lockout Rangers revival. I attended the game last night hoping for a win for the New York Rangers. Unfortunately, the game didn't work out the way I had planned it to. The Blueshirts took it on the chin by a final margin of 6-3. Henrik Lundqvist came up with a clunker of a game as 2 of his gaffs led directly to easy Montreal goals. The Rangers played catch-up hockey from there on until the game ended - never taking the lead. Montreal's first goal was an empty netter by Alex Kovalev off of a terrible pass by the King (Even I could have scored on that one). The Captain, Chris Drury, banked a shot off a Hab player to tie it at 1. However, a rotten line change lead to a huge rebound off of a Lundqvist save (not a good rebound). The rebound let to a Latendresse goal for the Habs, giving them a 2-1 lead. In the 2nd period Ryan Callahan, probably the MVP of the forwards this season, tied the game at 2. It was nice checker board type passing that lead to the goal. Early in the 3rd period, Andrei Markov ripped one of the best wristshots I have ever seen past a stunned Lundqvist - as a result, the crowd was stunned as well (it was a beauty)! 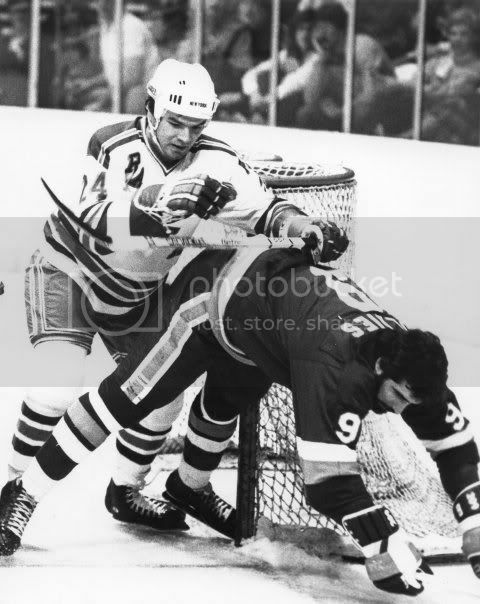 Later on in the period, the old pro Robert Lang (who ended up with a hat-trick) undressed Marc Staal on a one-on-one and roofed the puck over the King's shoulder (Staal's gotta keep his eyes on the body and not the puck). A little bit earlier, Rozsival got the rangers close, but Lang finished the scoring by adding the final 2 goals of the game to make it a 6-3 final and a win for the Habs. My observations of the game are that Callahan, Dawes, and Prucha stood out with their hustle and play throughout the game (Especially Prucha). Is it a good thing? I'm not sure. On a night where Georges Laraque is not in the line-up, I thought the Rangers might take it physical to Montreal - but that never happened. You've got to take advantage of chinks in the other teams' armor and that was one the Rangers could have used but didn't! Don't ask me why. I don't know. I also want to vent about the Gary Bettman rules of hockey. Hey, Gary... obviously some of your rules haven't worked. Fans get disgusted at some of the lame calls made in the NHL and there were some last night. Voros' hook? Rozsival's? And obviously there were some very valid calls (Gomez, what were you thinking?). Please don't insult me and the fans with the "I'm gonna make the game better" spiel, let the players play damn it! However, the best part of the night for my wife and I was seeing some old teammates and friends, as usual. Starting with Nicky Fotiu, Vic Hadfield, Rod Gilbert, Glenn Anderson, Rangers scout Ray Clearwater (He coached me in New Haven), Ron Duguay, and last but not least - Ron Greschner (His jersey should be retired... the numbers don't lie) and his lovely wife Lori (I was beginning to think that she didn't exist). In the end, it was a great night socially, but not so great for our beloved Blueshirts. Over and out! The New York Rangers got what I call a "much needed win" over the struggling Pittsburgh Penguins, 4-0. Yes, that's right, much needed in the sense that Philly and Jersey had jumped ahead of the Blueshirts in the Atlantic standings prior to tonight's game. Also, tonight's game restored the King's confidence, in a way, with his first shut-out of the year. I've said it before, and I'll say it again - without Henrik Lundqvist, where would this team really be? The Rangers had to kill off a 2-man disadvantage early that could of turned the game around for the Penguins after Nigel Dawes struck early on a, drum roll please.... POWER-PLAY. From there, I thought the Rangers played a solid and sound game in all areas. 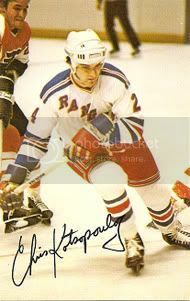 Paul Mara later blasted one by Marc Andre Fleury for a 2nd PP goal and the Rangers were on their way to the victory. Chris Drury and Scott Gomez rounded out the scoring to make the final score 4-0. It was a good night for the Rangers and what we all have to realize is that when this team puts out effort like the one that they had tonight, they can compete with anyone. However, when they play as individuals, the results aren't as good. The Rangers have no gamebreaking stud (like Ovechkin), what they have is top-notch goaltending and plenty of solid veterans. In order for them to win, they must play as a team - plain and simple. Unless there is an Earth shattering trade, that is the way this season will play out. Oh, I almost forgot, nice scrap by Orr with Goddard and congrats goes out to the Canadian Juniors squad who won their 5th championship in a row. Lastly, I will be attending the game on Wednesday against Montreal to see some former teammates and friends. I will have a full report when I get back! Over and out!